It's not even close to being cherry season yet, but still there are cherries for sale reasonably priced at the supermarket right now. I'm too lazy to find out, but I did buy them for the family and they were gone in a day. So for today's Wellness Wednesday post I thought perhaps we could look at the health benefits of this Christmas Aussie favourite. I actually wrote about cherries two years ago - specifically the benefits of cherries as a sleep aid. You can read about that here. They are a great snack before bed because they contain the sleep hormone Melatonin. What other health benefits do cherries have? 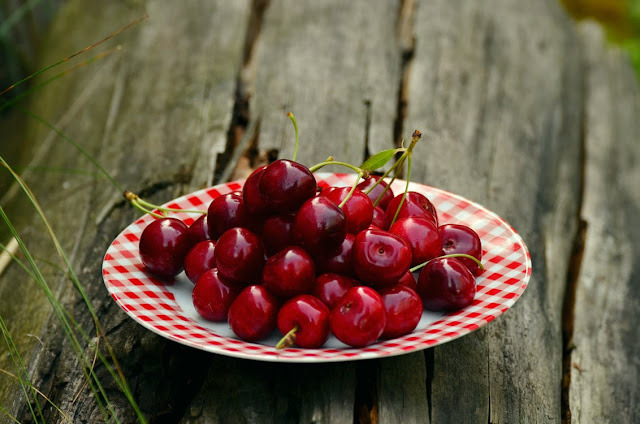 Cherries are a good source of antioxidants which means they are a great way to help fight those horrid little free radicals which they say are responsible for some cancers and the aging process. Cherries can reduce blood pressure according to a study conducted at Northumbria University slashing the risk of stroke by 38 per cent and heart disease by 23 per cent. Cherries contain anthocyanins and bioflavonoids which the Journal of Nutrition suggests can ease joint inflammation for people who suffer arthritis or gout. Studies have shown that cherries can reduce the symptoms of Alzheimer's disease and Huntington's Disease. So if you're lucky enough to spot cherries at the supermarket, then pick yourself up a pack! They're a great snack with a swag of health benefits. Where are they coming from? Has Christmas come early? Note: I am not a dietitian nor nutritionist. Not even a foody. I just enjoy reading to find out the health benefits of foods to help people to age positively. Well I'm very glad to read this seeing as I just demolished a punnet :-) . $5 from the USA. I know I should feel guilty about the air miles but they were so yummy and good for me!